Internet access is limited (I only get it at the film festival place, not my hotel), so haven't been giving people as many updates as I wanted. One more hour before the second KINGYO screening in Venice. My two actresses, Luchino Fujisaki and Amane Kudo had just arrived last night, so they'll be present for today's screening. Hope the reception will be as warm as the one I got two nights ago. After making a few successful short films, filmmaker Edmund Yeo finally hit the big one as his Japanese short film, Kingyo, is competing at the Venice International Film Festival. YOUNG filmmaker Edmund Yeo is a little concerned about the Venice International Film Festival, where his short film, Kingyo (Goldfish), is competing. He’s a little amused by the attention he’s been getting lately. He’s shy about the large contingent his university, Waseda in Tokyo, is sending to Venice. The university is so proud of his achievement that it’s sending practically everyone involved in the film to accompany him at the festival. And the latest is that a British documentary crew will be following him around in Venice, as part of a documentary that they’re doing about filmmakers who are in competition there. But he says there’s no pressure, only elation at the chance to share the stage with the world’s best. Yeo is not exactly new to this kind of exposure. Anyone who’s followed his career so far would know that he has even appeared on a local TV show to talk about video blogging. Apart from being among the few Malaysians doing video blogging, Yeo is also a producer with Woo Ming Jin’s Greenlight Pictures, and has worked on Woo’s award-winning The Elephant And The Sea, and the director’s various TV movies, including Kurus and Cinta Tiga Segi. 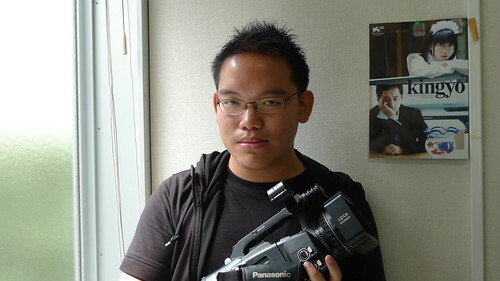 Yeo also won an Honorable Mention for his short film, Chicken Rice Mystery, at last year’s BMW Shorties competition. And this year, a bunch of his short films have been invited to various festivals. And this year, he produced Woo’s Woman On Fire Looks For Water, which will also be screened in Venice. He’s definitely one to watch for. And Yeo is only 25. In all his short films, Yeo has shown a penchant for the poetic. Kingyo is perhaps a culmination of all his attempts at visual poetry in shorts like Fleeting Images and Love Suicides. A few months ago, he kindly sent me a copy of the film from Tokyo, and it proved to be a mature and moving piece of work. It is an adaptation of Nobel laureate Yasunari Kawabata’s 1924 short story, Canaries. Love and memories: Stage actress Amane Kudo is one of the actors in Edmund Yeo’s Kingyo, which is based on Yasunari Kawabata’s 1924 short story, Canaries. Kingyo tells of two former lovers who meet again, only to discover that they share a certain guilt linked to a bowl of goldfish. The Venice festival describes it as “delicate and refined”, a more than accurate take on the 25-minute film that cleverly uses split screens to portray the mental and emotional connection between its two leads. After he moved to Tokyo last year Yeo was eager to make a short film there. It seems that everything he does, every place he goes to, he sees an opportunity to tell a story. His Fleeting Images is composed of images from his time in Japan and India. After he went location scouting for a Greenlight Pictures project in Klang, Selangor, he came back with another short film, Afternoon River. Fleeting Images will premiere at the Singapore Short Film Festival and then at the CON-CAN Movie Festival in Japan this month. During a brief break in Malaysia earlier this year, Yeo made Love Suicides (which premiered at the Paris Cinema International Film Festival in July), which is also inspired by a Kawabata short story. “So, I thought I would go for another interpretation of the famed writer’s works, and set the film in his native country, while making use of certain filmmaking styles that I wanted to experiment with,” says Yeo. With help from his producer Maiko Itagaki, they sought the help of his professor and the university in terms of funding. Then they got together a Japanese cast that included Rukino Fujisaki who debuted in the film Hellevator, performance artiste Takao Kawaguchi, and Amane Kudo, a stage actress who had a role in the film Babel. The subjects tackled in Kingyo (Canaries is a two-page story told in the form of a letter) are no lightweight stuff – a love triangle, people burned by painful memories and guilt. Being so young, how is Yeo able to tackle such a mature story? “Kingyo isn’t autobiographical, but some emotions of the film are drawn from personal experiences and maybe, my own world-view,” he replies. Read the rest of the article. To have an article and my screening on the 9/9/09. How awesome is that!